Heavy-duty yet lightweight and compact aluminum design?supports up to 20 lbs. of display weight. Sets up in seconds. Portable unit collapses from 63"" to 25"" for easy transport. Lock the sturdy, adjustable display holders in place on the easel legs to customize the height. Features antiskid feet to prevent shifting. 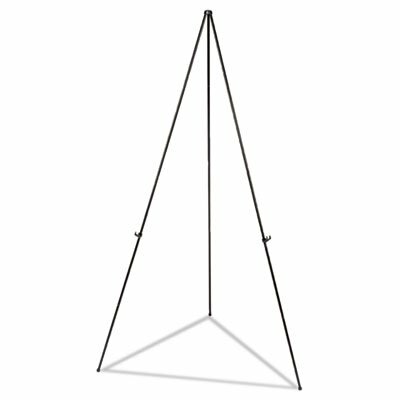 Easel Type: Folding Display; Maximum Easel Height: 63""; Material(s): Aluminum; Color(s): Black. Heavy-duty aluminum foldaway portable easel with adjustable display holders. Heavy-duty yet lightweight and compact aluminum design?supports up to 20 lbs. of display weight. Portable unit collapses from 63"" to 25"" for easy transport. If you have any questions about this product by Universal One, contact us by completing and submitting the form below. If you are looking for a specif part number, please include it with your message.